The pre-World Cup craze for Freeview HD boxes aside , the idea of adding a simple receiver to a home ents set-up could seem a rather primitive way of accessing hi-def. Step forward a new batch of Freeview+ HD kit, digital video recorders that seek to ape the likes of Sky+ and Virgin Media V+ and offer something more than just BBC HD. The bulky DHR8203U from Digital Stream is one of the first Freeview+ HD recorders to hit the market, and could remain one of very few products of its kind for some weeks. 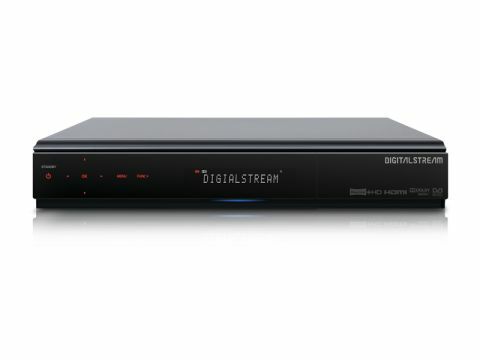 It may be a relatively new brand, but Digital Stream's DHR8203U has an impressively solid look and feel to it – and plenty of offer on the inside, too. The headline feature is that this black box with soft blue lighting and red-lit touch sensitive controls (which flash yellow when touched) hides a 320GB hard drive. It can store around 180 hours of standard definition recordings, or 60 hours of hi-def TV. Boasting one-touch and series link recording, the DHR8203U's ins and outs comprise HDMI, two Scarts, composite video, stereo audio, optical audio and a Common Interface slot for adding Top Up TV viewing cards. Although its Ethernet LAN port won't connect directly to BBC iPlayer services, it's part of the Freeview HD box specification because it does allow manufacturers to send updated software – which could include any 'Project Canvas' portal that develops. And that will undoubtedly feature iPlayer alongside ITV Player, 4OD and other commercial on-demand TV platforms.